Fixed height extensions for use with Lock'n Pin seat mounts and base plates. 1.5” dia. 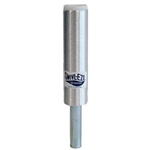 satin finished aluminum post with 3/4” steel pin. Extends 2-3/4" below deck. ABYC Code B.